I’m almost as excited to share this project with my readers as I was to complete this project for myself! Creating this vintage train case turned marker holder has been my goal for a while, but it’s taken some patience to find the perfect train case and marker holder that fit without wasting a lot of interior space. 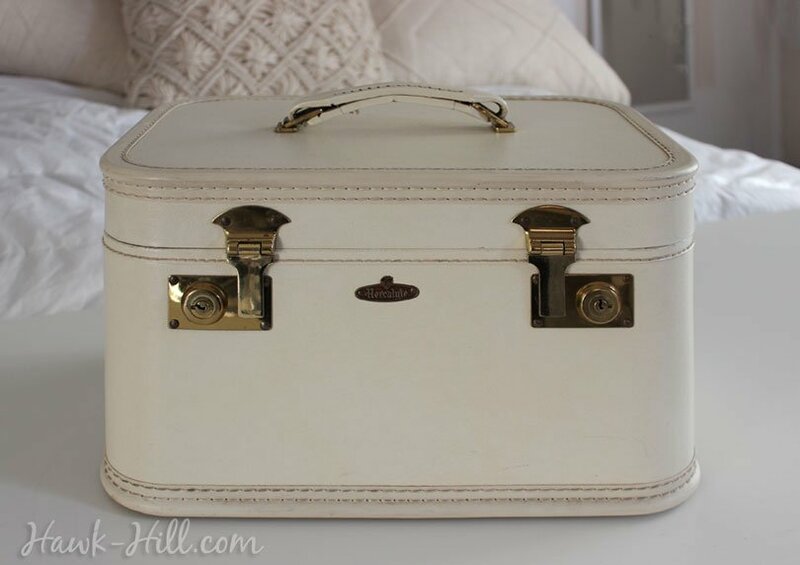 Sometimes called cosmetic cases or just vintage cases, train cases were the “carry on luggage” of the era of train travel- although they actually peaked in popularity in the 60’s and 70’s as precursors to the “kaboodles” cosmetic cases of the 80-90’s. 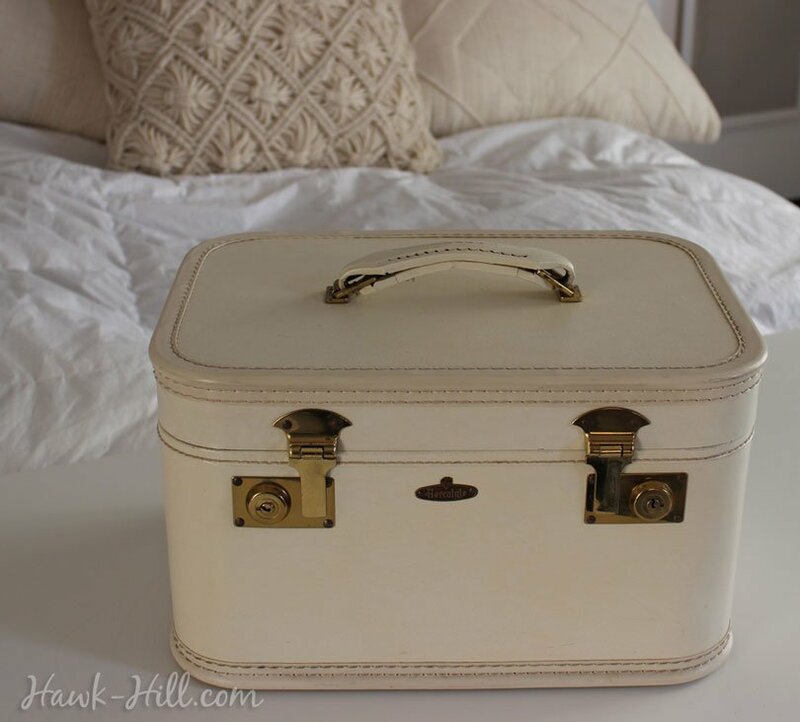 Today vintage train cases are pretty easy to source at thrift stores and flea markets. To get your pick of the litter, try eBay, where you can be pickier about color, closure style, and a functional lock. 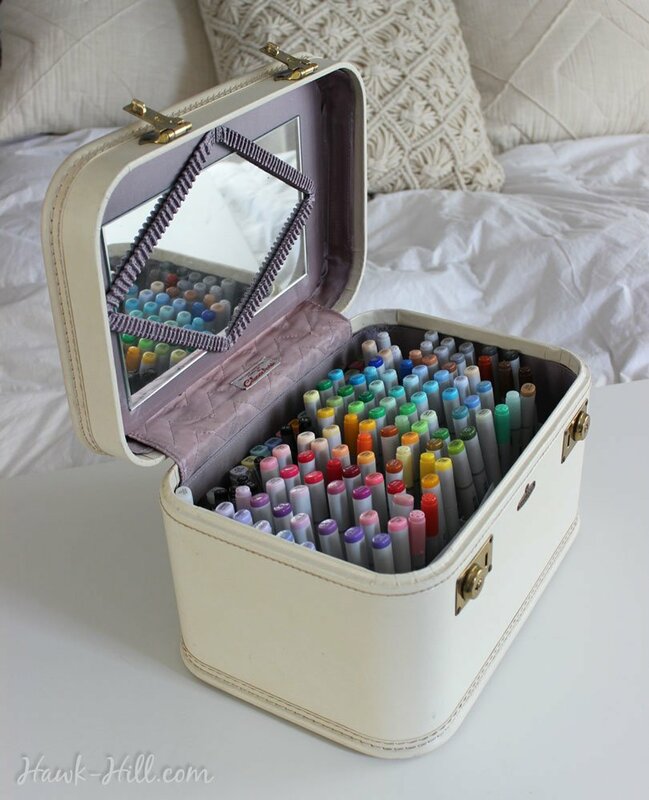 Not only do they make great art supply storage that can be left out without feeling messy, they’re still a great way to store and transport makeup- especially if you have a bathroom with a lot of counter space but not a lot of storage. In this tutorial I’m going to show you how to take the commercially manufactured marker holders that are intended for use in the not-so-attractive utilitarian art cases designed for crafters and scrapbookers and adapt these marker holders (that work well for paintbrushes, pens, pastels, tubes of watercolors, or any other tall skinny art supply) for use in a vintage cosmetic case. 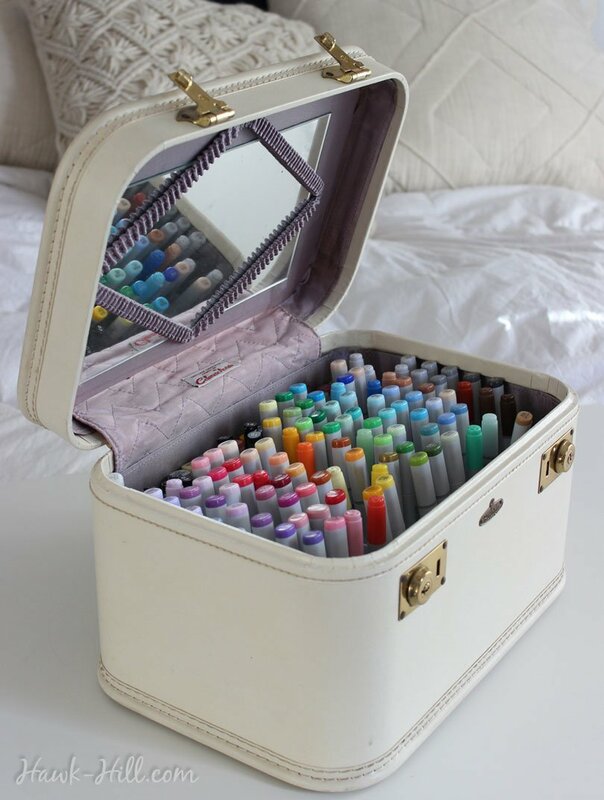 When I was hunting for a way to store my markers I just couldn’t find a commercially available art supply case that was functional and stylish. Utilitarian plastic boxes can work great if you’ve got an art closet or dedicated place to stow them, but in my downtown apartment space is at a premium and there’s no good place to squirrel away art supplies that would still keep them handy to retrieve and use on a whim. 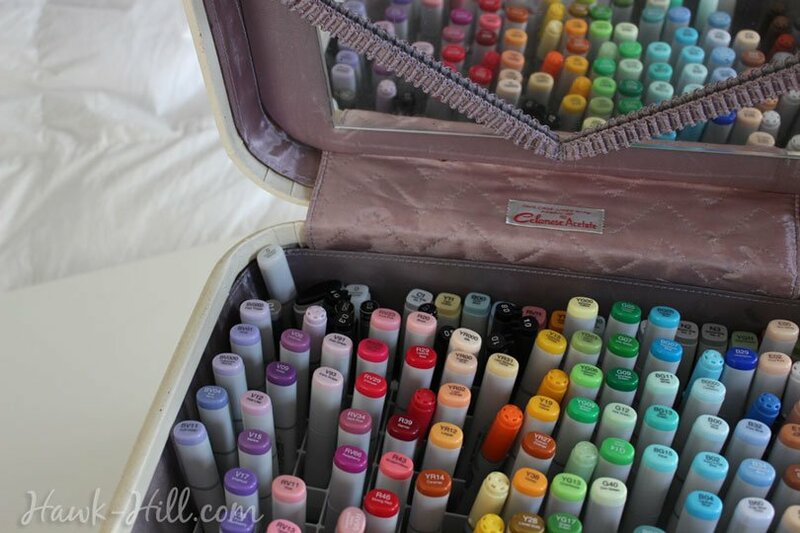 My challenge: find a way to store my markers in plain sight that wouldn’t stick out like a sore thumb in my 100-year-old apartment. 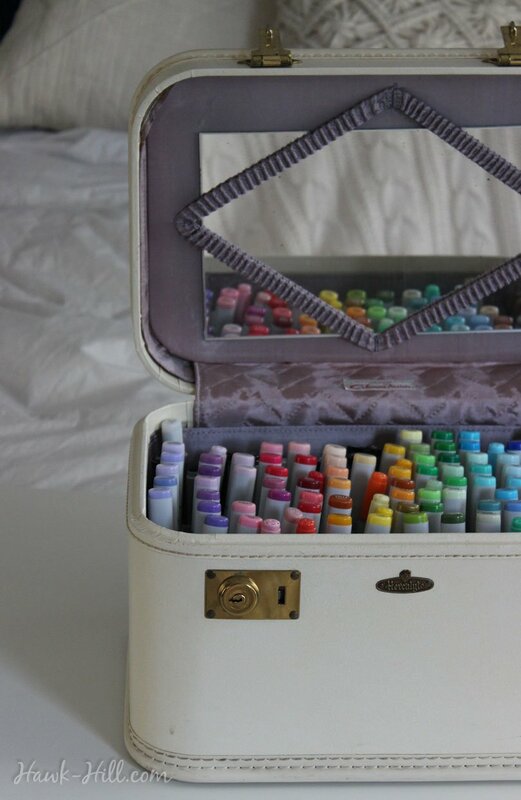 I created this marker storage purely for aesthetic reasons, but there’s been a really fun surprise: storing my markers in this vintage tote in the middle of my living space has meant that my markers are almost always within arms-reach, and having them so close all the time has resulted in me using them to spontaneously create art much more often! I’ve always loved using vintage items for useful, utilitarian purposes, but my affinity for this kind of thing really exploded after I moved to Seattle in 2015. 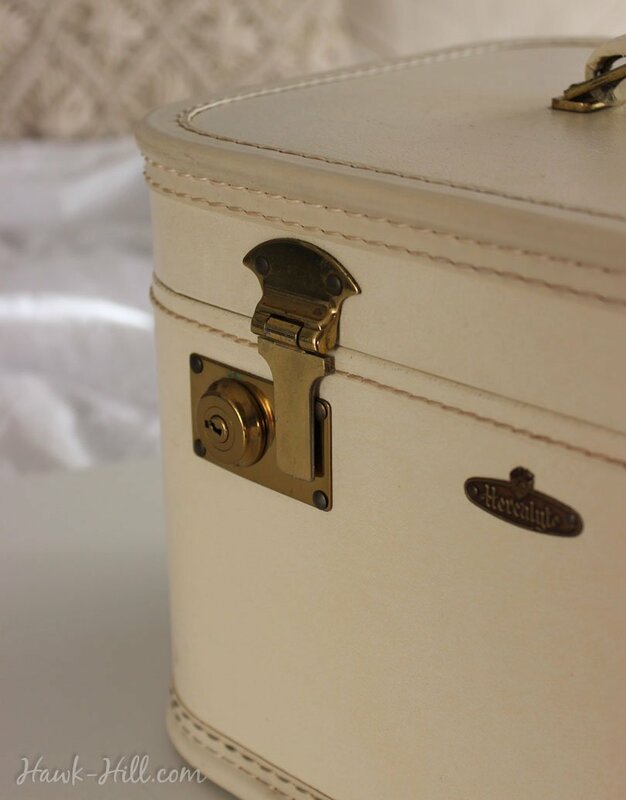 Living in a 280 square foot apartment, there is simply no space for items that are “just decoration,” so I’m becoming increasingly skilled at figuring out how to blend aesthetics and function, especially in vintage objects. 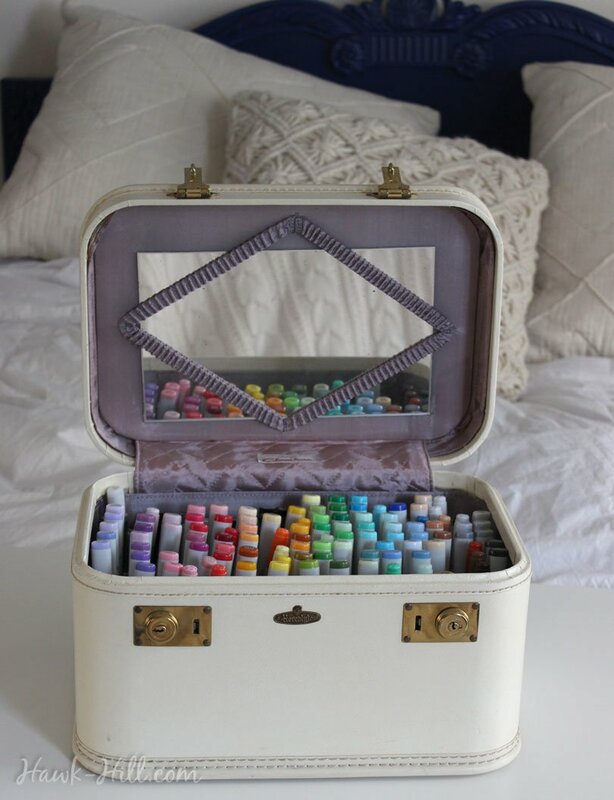 Since the move, I’ve been adapting vintage cases to hold all kinds of odds and ends- including my entire store of art supplies. 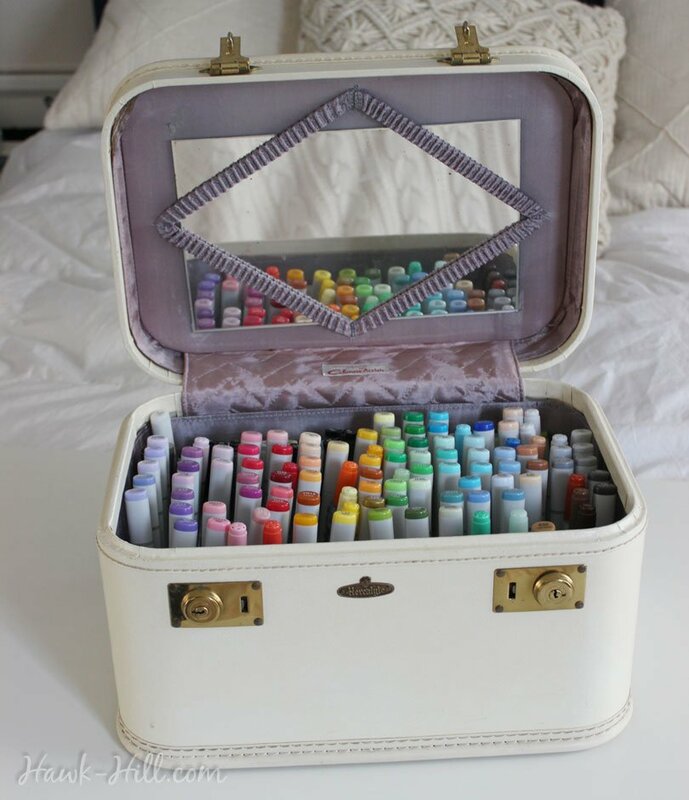 With my entire collection of Copic Art Markers organized inside this case, I can display the case right next to my favorite chair in my apartment instead of having yet another box shoved in an overflowing closet. 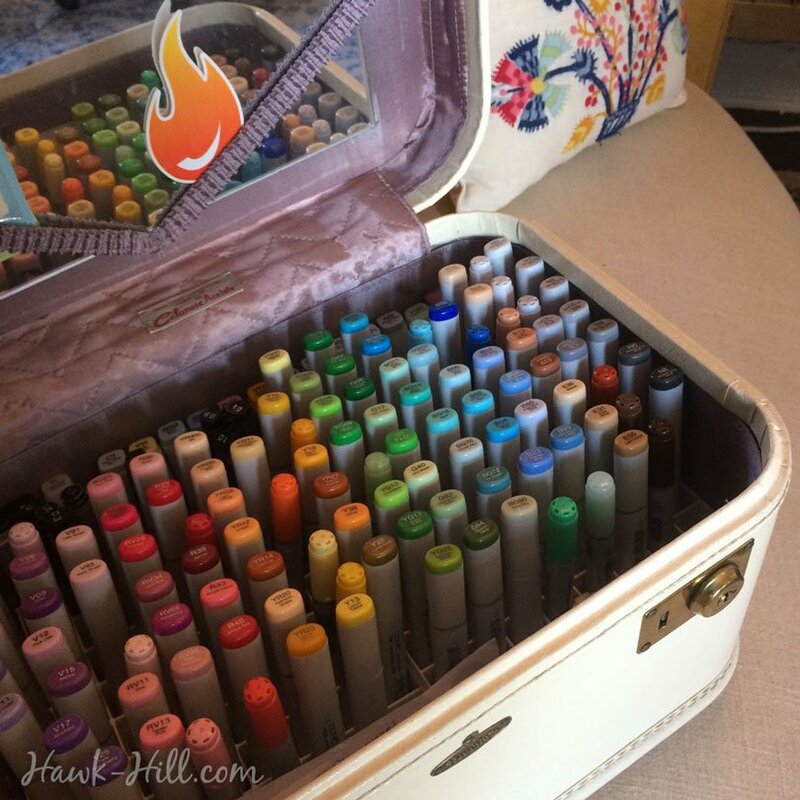 I like having my markers in my living space and ready to use on a whim- My creativity increases when supplies are within arm’s reach. 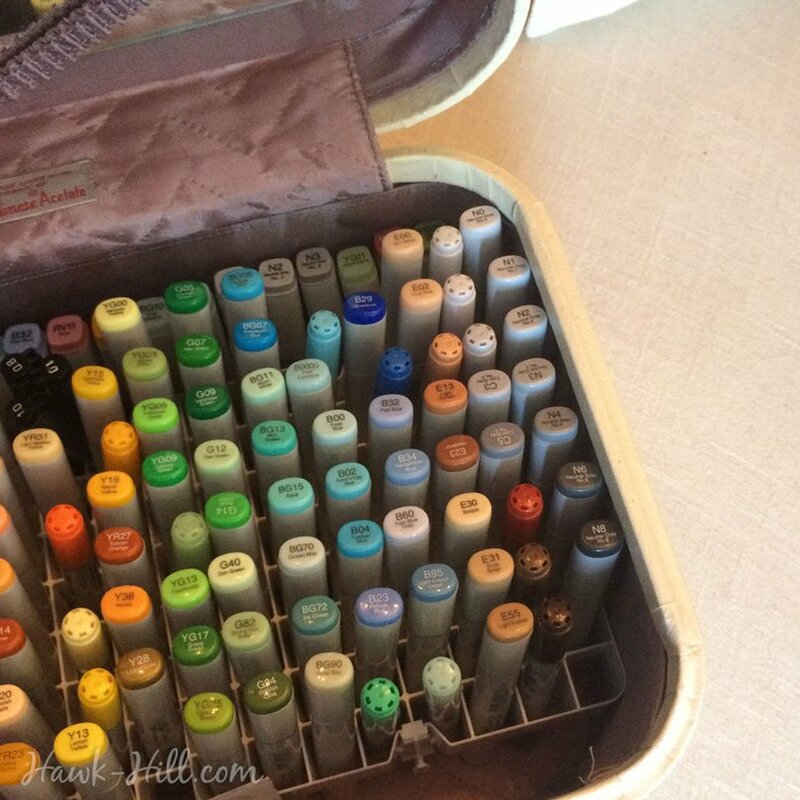 I use illustration markers primarily for sketchnotes and graphic recording. Click here to see my marker art. 1. 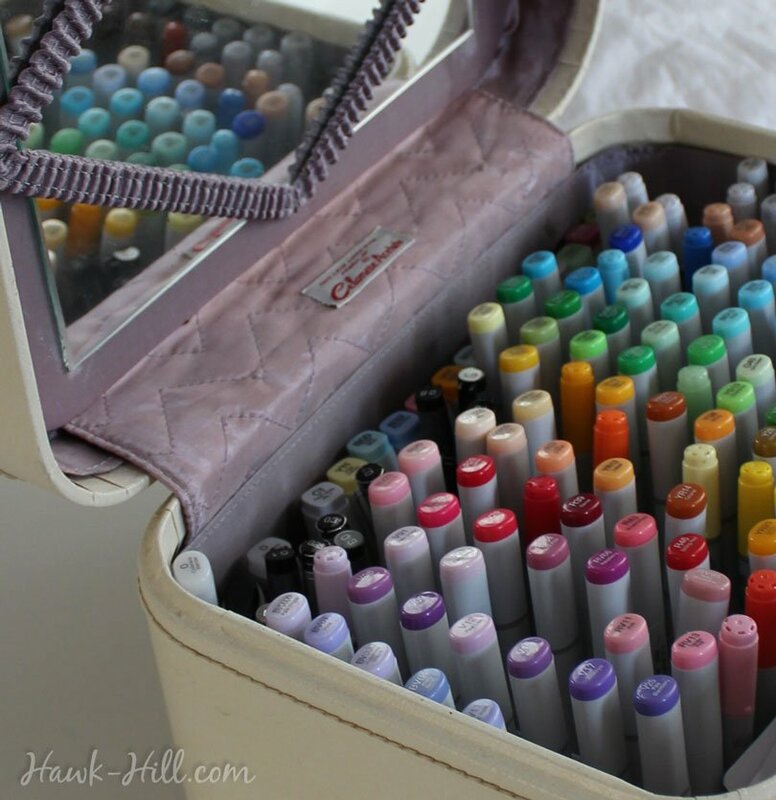 Get marker trays or a plastic grid. 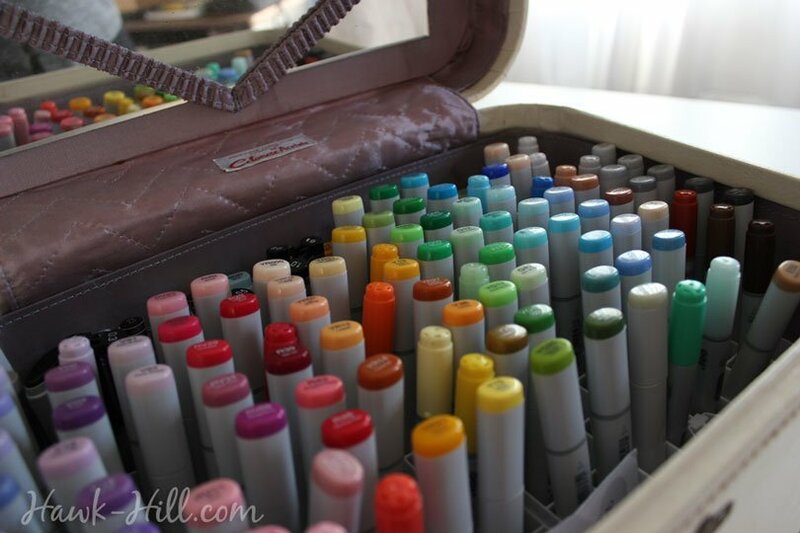 I used ArtBin Marker Trays. 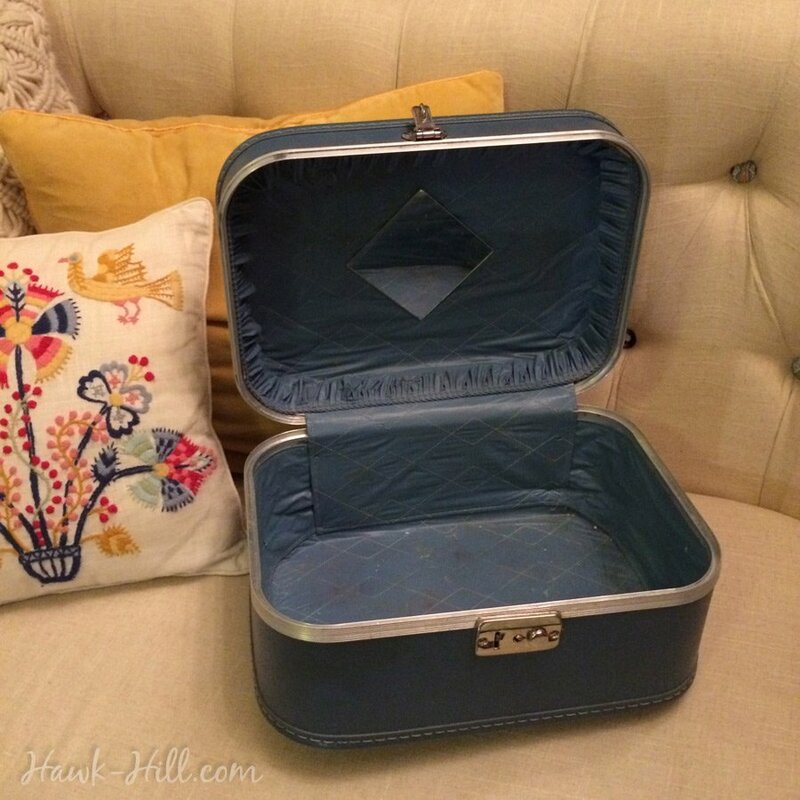 Traditionally called “train cases,” vintage cosmetic cases are my favorite- in the Pacific Northwest, I can sometimes find them at flea markets or thrift stores in the $10-$20 range, or more reliably at vintage shops or eBay for $25-$50. 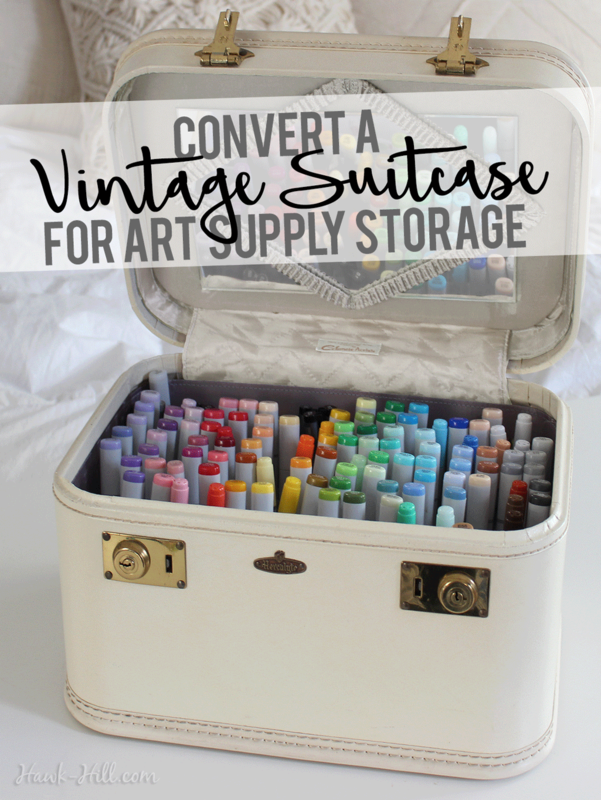 You can use an old suitcase for this project, but you’d need to recalculate how many marker trays you need and potentially need to build in a framework to support and secure multiple trays. 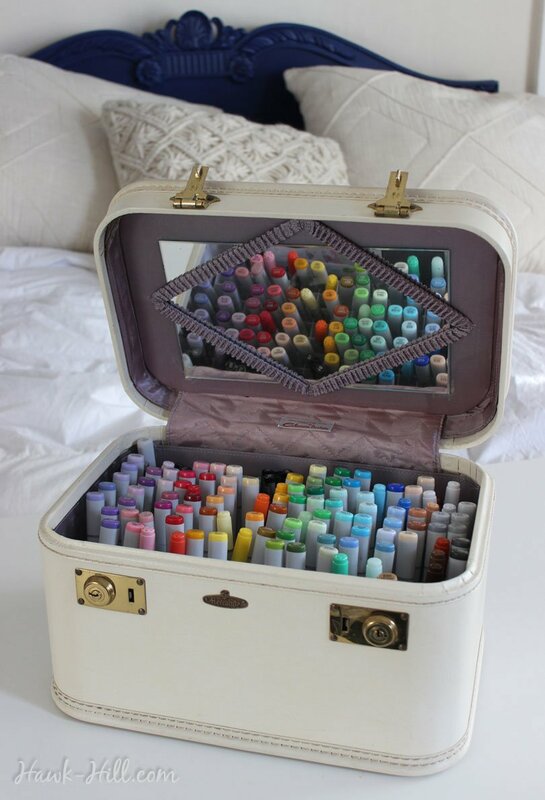 The advantage of using a suitcase would be that the markers would be stored horizontally when the suitcase was closed and sitting upright, which is the manufacturer’s recommendation and an especially good idea if you don’t use your markers often. 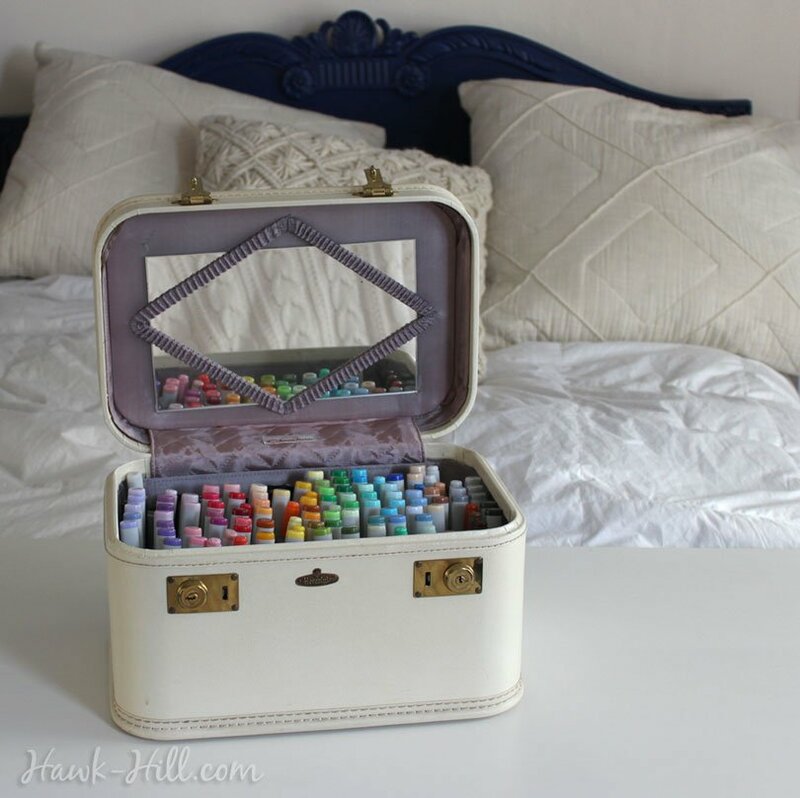 This light blue cosmetic case was my first attempt to create this marker storage case. 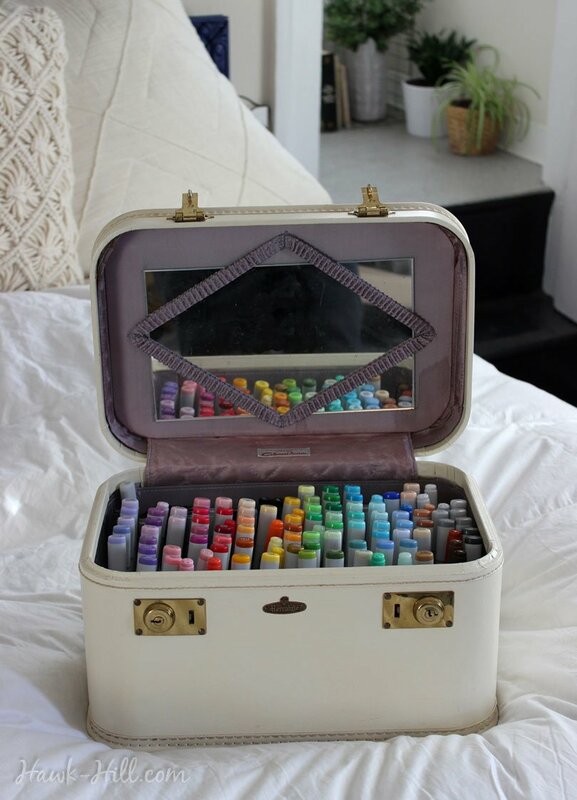 This train case, it turned out, was just fractionally too small to hold two marker trays side-by-side, so got relocated to my bathroom as a place to hide cosmetics. With an interior width of 12,” the case above was too narrow to fit two marker grids side-by-side. 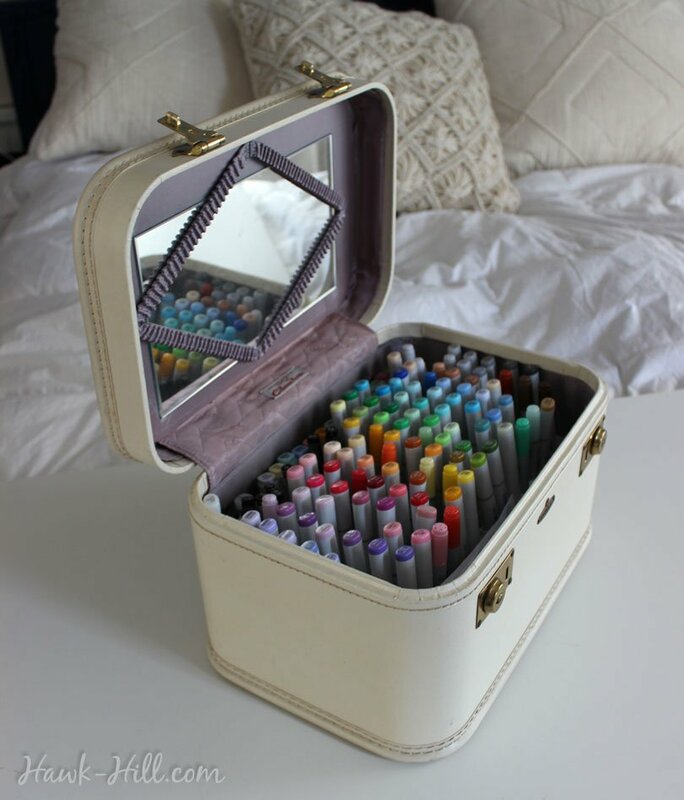 My second case measures just under 13″ wide on the inside, and so was able to accommodate the 12.5″ width of the double-wide marker trays. 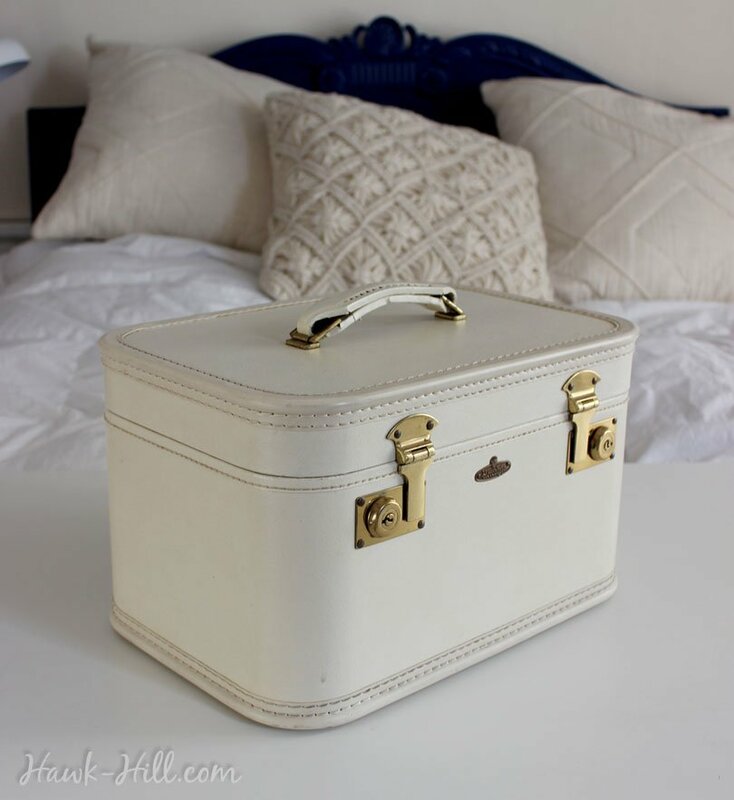 Skyway brand cases are my favorite, since I attend a graduate school housed in their former Seattle factory, but this dreamy Herculyte case in off-white was perfect and had a pricetag of $14 at a local Goodwill. I like the ivory finish in my apartment full of creams and whites. Use the included clips to raise the tray off the bottom of the case. This will help the markers remain more upright. 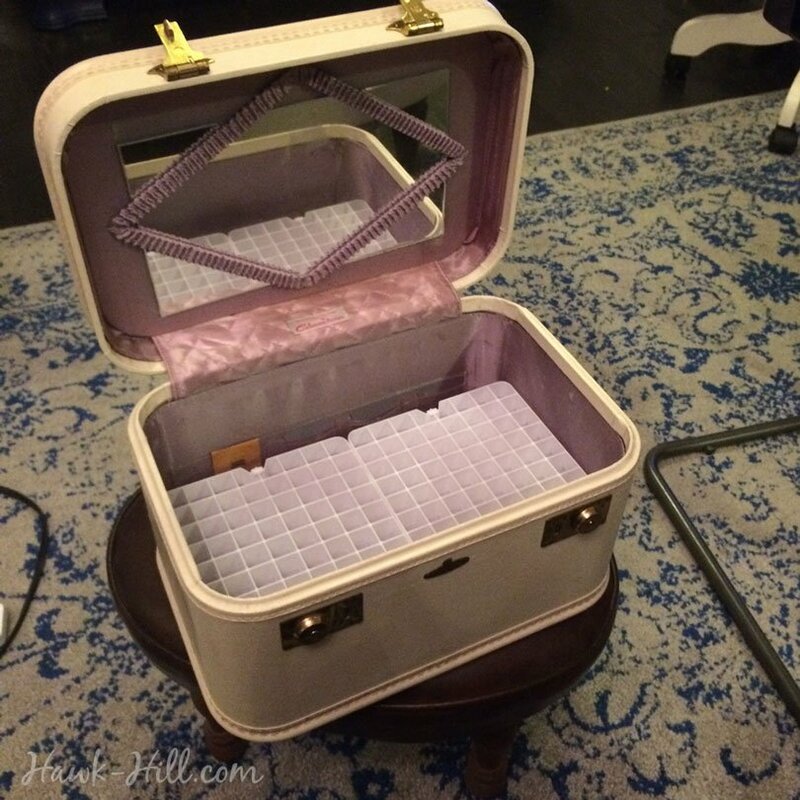 If the elevated trays aren’t held stable by the sides of your case (it will depend on the width of your case) add a few dots of hot glue to the edge of the marker tray to help hold them in place, snug against the lining. 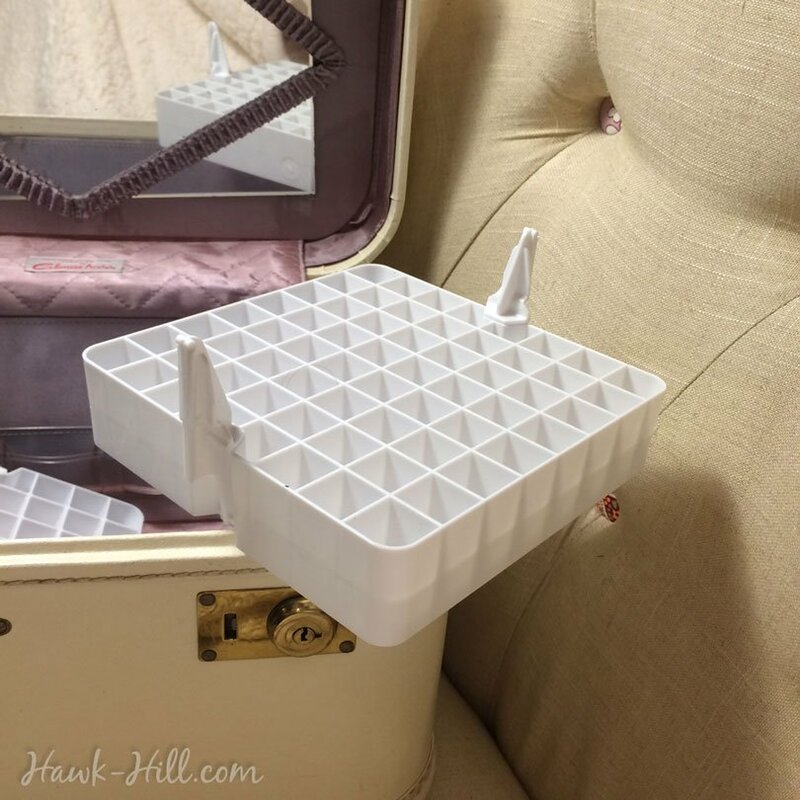 (If the hot-glue doesn’t hold, and you’re positive of placement, you can use an epoxy paste to both fill and gaps and totally, forever-permanently secure the tray to the sides of the case. These clips are meant to secure the tray in place in a branded plastic case, but, used upside down, they work well to elevate the tray to stabilize the markers. 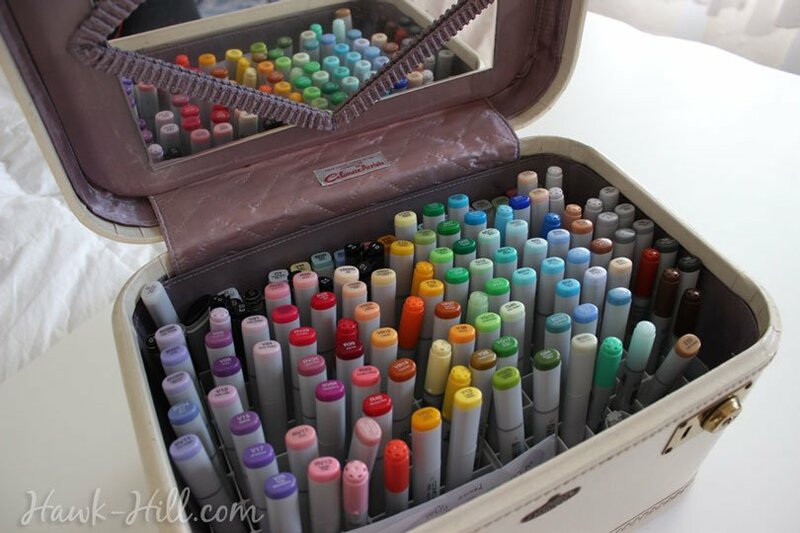 For best results, you want the marker trays kind of snug, as shown. If they have lots of room to wobble, you can either permanently secure them with epoxy or fill the gaps with hot glue. Hot glue applied to sides and allowed to harden before placing into the case creates a non-slip bumper to help the trays stay in place. 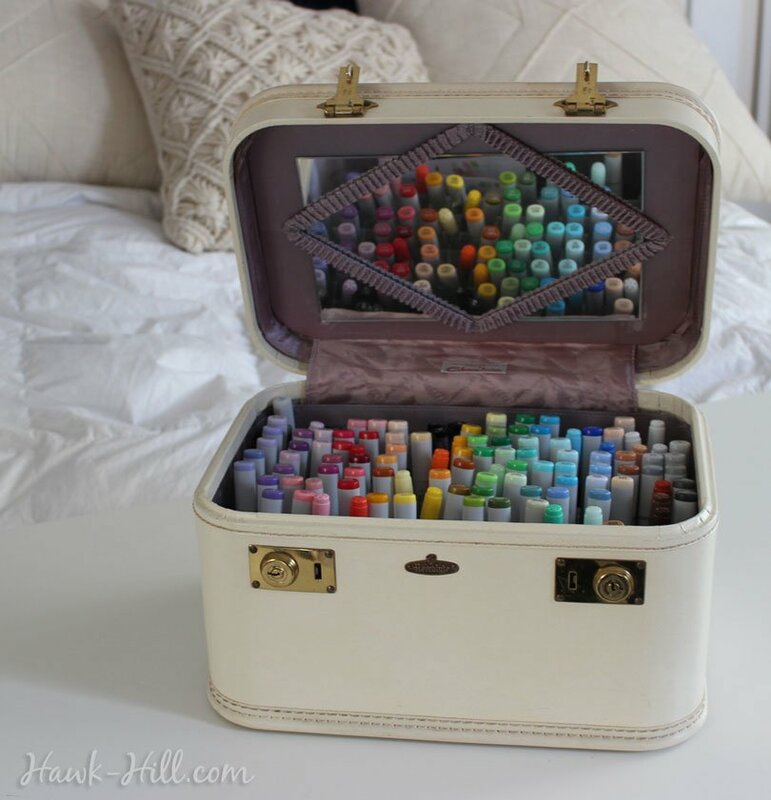 This vintage converted art case is one of my very favorite projects from the last year. 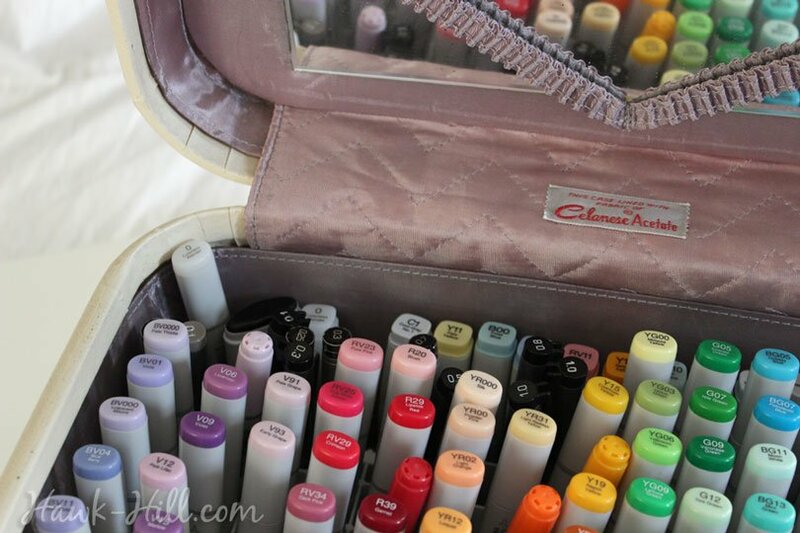 It’s so fun to always have my markers at hand, and this case makes them really, really easy to grab to take with me to art nights with friends or even to do illustration work at a cafe or on business trips. In this case, for the first time I can really get a good view of my markers and the shades I have and the shades I need for a more balanced palette. 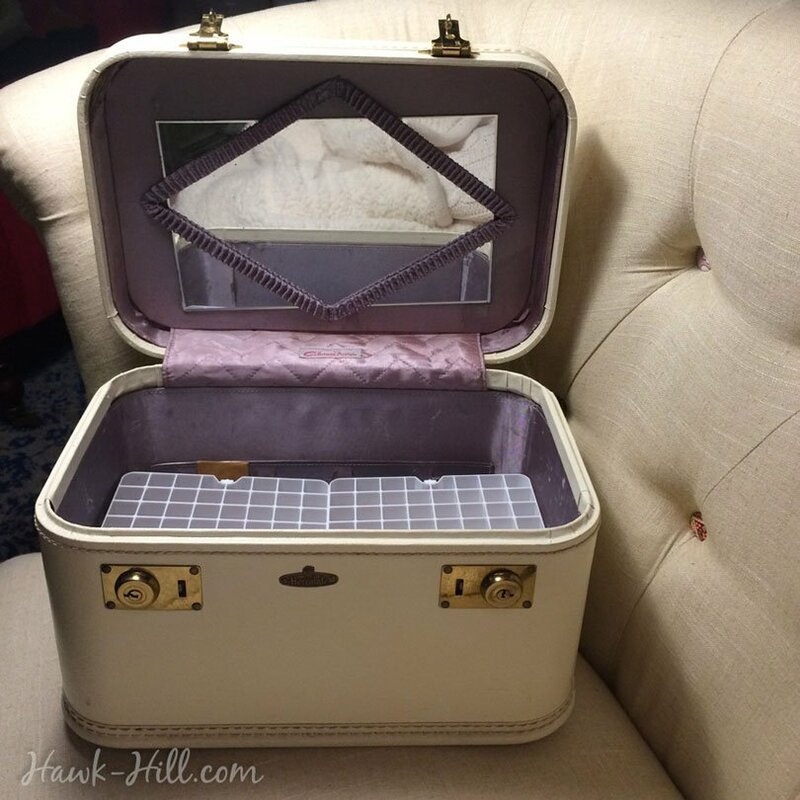 In a standard train case, like the one I used. About 130 slots are open, with space at the back for about two dozen copic various ink refills. Set up on my bed on my makeshift table. With a 280 square foot apartment, a large work table isn’t possible, so I keep a $10 ikea desk top (without legs) around, tucked under my bed, to pull out when I need a large, flat surface for creating. 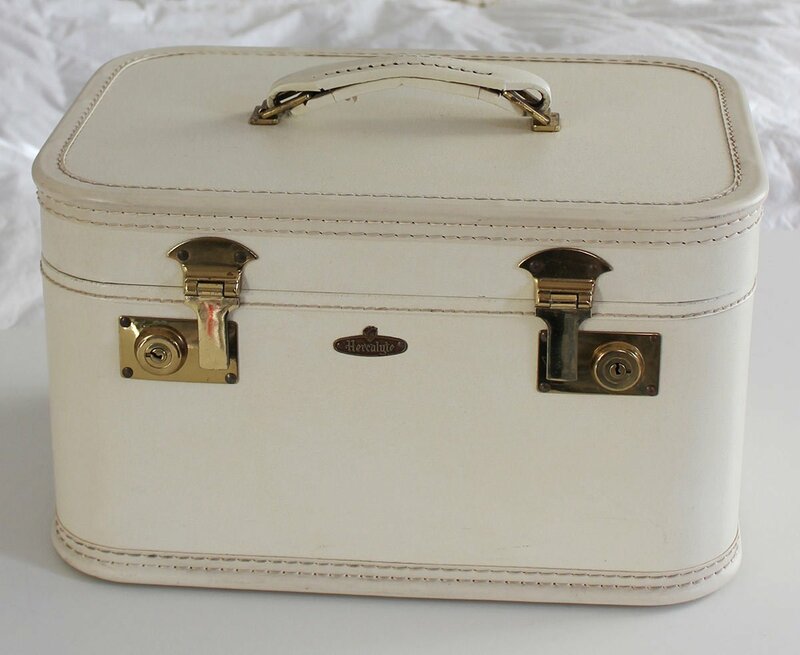 Vintage suitcases and traincases with functional locks & keys included are easy to find on eBay. They are usually a little more expensive, but may be worth the convenience and peace of mind. That’s it! Once you’ve located a train case and marker trays this is a 20 minute project! Did you try it? I’d love to hear how yours turned out. Leave a comment below! 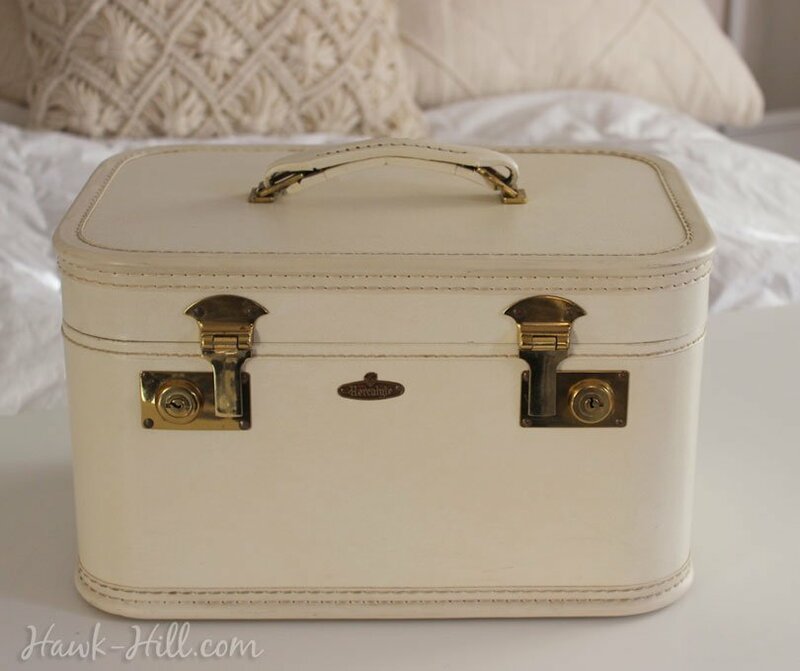 I don’t know I found you, but I’ve been collecting train cases for years and love them. I use them for lots of things but had never thought to make them work for markers. thanks for the inspiration! 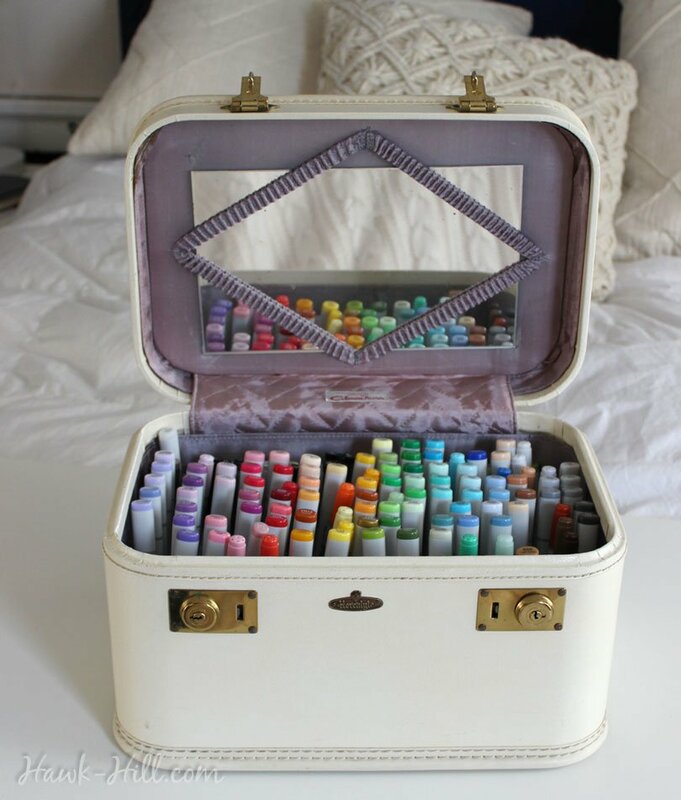 Super idea for beautiful marker storage and transport.